The Elinchrom 800W/s D-Lite RX4 Monolight Kit is an all-in-one kit that is ideal for studio shooting. Included are light stands, softboxes, a wide 90° angle reflector, a convenient carrying case, and a radio trigger that allows you to fire your flashes from your camera wirelessly from up to 393' feet away. This kit is large enough for family shoots and ideal for 1-2 person shoots. The auto-sensing, multi-voltage D-Lite RX 4 heads recognize any AC power source from 90-260V AC, allowing you to use the kit anywhere in the world. 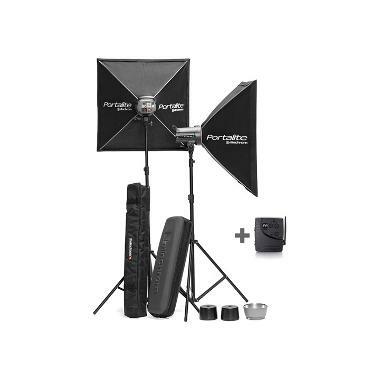 • This kit comes with a 1/8-PC sync cable to fire the lights from your camera. It also comes with a Skyport Transmitter to wirelessly fire the lights from your camera. Alternatively, you may rent Pocket Wizards, which are not included. A minimum of 2 Pocket Wizards with a 1/8th-1/8th sync cable must be rented to wirelessly fire this kit without using the included 1/8-PC sync cable or Skyport Transmitter. • This kit does not come with a power or battery pack and must be plugged in with AC power to operate.